Category Archives: PRO OBAMA AT ALL COSTS. By David Preiser (USA) | May 9, 2011 - 7:41 pm | August 25, 2013 al quaeda, Mark Mardell, obama bias, Obama worship, Pakistan, PRO OBAMA AT ALL COSTS. BBC North America editor Mark Mardell is in a dark place these days. After his beloved Obamessiah turned out to be a cold-blooded assassin, he doesn’t know which way to turn. He’s tried blaming ugly United Statesians for forcing the President to kill because it plays well at home, refusing to call out the President Himself. Mardell never made much of a fuss about the fact that the current President has sent unmanned drones to kill far more people in Pakistan than the previous White House occupant did, so it’s not surprising that this particular targeted assassination has shaken his faith so badly. To their credit, the BBC has reported this elsewhere, but it’s remarkable that Mardell doesn’t seem to make the connection. In his latest post, Mardell misrepresents reality to sing His praises for one last time. From the very start of his presidency, Mr Obama’s administration has made it clear there is no such thing as an Afghan strategy. First it was an Af-Pak strategy. Then it became Pak-Af. Whatever you call it, there is an acknowledgement that Pakistan may be the more important country in the fight against al-Qaeda. Everyone in the know believes some members of the government and particularly the intelligence service are hand-in-glove with the jihadists and must have known what Bin Laden was up to. This implies that Bush’s focus on Afghanistan was wrong and that he somehow neglected Pakistan. In fact, the only reason Al Qaeda had such a presence in Pakistan was because they had been largely forced out of Afghanistan by Coalition forces during the last several years of fighting. Even the BBC has admitted that in the past. Yet Mardell wants you to think that only The Obamessiah understood that Pakistan was a problem. Why would Bush have been sending drone attacks into the tribal areas if he didn’t also have an Af-Pak strategy of some kind? In any case, Mardell’s crisis of faith continues. In fact, it’s getting so bad now that I think I’m nearly ready to stop with this “Obamessiah” business because I think Mardell and his colleagues are nearly done with their blind worship of Him. Mardell himself reveals why. While this debate will go on, the Mr Obama doesn’t have to worry about some of the concerns expressed in the rest of the world about the legality or morality of killing Bin Laden. It has hardly been raised by anyone here in the US, and the president has said that anyone who questions taking the al-Qaeda leader out “needs their heads examined”. Mardell questioned it and denegrated the US public over it in his last post, so this means that the President is actually saying that he, too, needs his head examined. The BBC North America editor must be questioning his faith now. What to do? We’ll see how he handles it. Victory Lap or Somber Occasion? Whatever the White House Says It Is. Not a single voice allowed on the BBC today to criticize. Every single Beeboid on air is saying how wonderful this is, and how this is “paying respect” to the families and is absolutely not a victory lap or moment of opportunism. Of course, they don’t know what He thinks, or what this really is, but they are telling you nevertheless. All US vox pops are positive, enthusiastic, supportive. The BBC is also helping to spin the White House talking point that Bush forgot about Bin Laden and it was only the current President who cared. There is still no mention on the BBC of the fact that the name of the courier was obtained during the Bush Administration, and that Sunday’s event was the culmination of years of work. Mustn’t harm the Narrative. No sneering at the President telling firemen in NYC that He’s “got your back” in front of the whole press corps, something that ought really to have been a private occasion. In fact, this, as Huw Edwards told us twice now, is “the defining moment of His Presidency”. He spoke to Eleanor Clift, but forgot to mention that she’s a die-hard Democrat and supporter of the President. Where are the critical voices? Surely there must be someone in the country who thinks this is unseemly? Or someone who might think it’s odd that He never visited Ground Zero as President before but runs down there now? You won’t hear any editorializing or sneering today from the Beeboids. Not even from Matt Frei, who has his best serious journalist face on. today. Only respect for the White House agenda from the BBC. An impartial broadcaster should not be telling you what His motives are, or whether or not this actually is the right thing to do. They should be telling you what’s happening, and what various opinionmongers think it means. The Beeboids themselves should not be telling you what to think about it. Yet they do. Note to Matt Frei: Today’s visit wasn’t supposed to be about Him, right? It’s supposed to be about the victims, their families, healing, and possibly some closure for the country’s psyche. Except you and your colleagues are making it all about Him even while you pretend you’re not. The U.S. Navy fires the first U.S. Tomahawk cruise missiles against Libyan leader’s Muammar al-Qaddafi’s air defenses Saturday, a military source tells Fox News. The U.S. military strikes clear the way for European and other planes to enforce a no-fly zone designed to ground Qaddafi’s air force and cripple his ability to inflict further violence on rebels, U.S. officials said. A U.S. official, speaking on condition of anonymity in order to discuss sensitive military operations, said the Obama administration intended to limit its involvement — at least in the initial stages — to helping protect French and other air missions. French fighter jets fired the first shots at Qaddafi’s troops on Saturday, launching the broadest international military effort since the Iraq war in support of an uprising that had seemed on the verge of defeat. The French military says warplanes have carried out four air strikes, destroying several armored vehicles of pro-Qaddafi forces, according to AFP. So those damn Froggy warmongers (always spoiling for a fight, right?) drew first blood, and the US was close behind. What a difference from when Chirac wouldn’t even let us fly over French airspace to go after Sadaam. A French plane has fired the first shots in Libya as enforcement of the UN-mandated no-fly zone begins. The UK prime minister later confirmed British planes were also in action, while US media reports said the US had fired its first Cruise missiles. So who took the first shot? The stringent US media says – natch – the US fired first. Of course, they would say that, as Mark Mardell’s reporting would give us the idea that only all those foolish United Statesian warmongers obsessed with the notion of American decline would demand it. Unapologetically leading the charge and all that, yeah. In any case, I can’t recall any criticism aired by the BBC from French anti-war voices. Is it not ill-advised when the French do it? Was there a segment with their equivalent of Caroline Lucas saying, “Pas de guerre pour l’oeil“? Other air forces and navies are expected to join the French. “Other air forces”. As if we couldn’t guess immediately which other ones are involved, and it’s not so important who they are. Except of course it’s vitally important for the BBC Narrative who they are. The US would use its “unique capabilities” to reinforce the no-fly zone, said US Secretary of State Hillary Clinton, warning that further delays would put more civilians at risk. However, Mrs Clinton said again that the US would not deploy ground troops in Libya. The BBC News Online editors are just playing games here. The Prime Minister also said yesterday that nobody was going to occupy anybody, essentially no troops on the ground, full stop, occupation is “not going to happen”. It was aired at least twice on the News Channel yesterday. No mention of that at all here, even though it’s more relevant to the license fee payer who might be concerned about, you know, their own government. But the BBC’s focus is exclusively on protecting the US President here. He’s not George Bush, dammit. Fox News, naturally, is focused on the US angle, and how the US is leading the way. On one level, this would seem to please those whom Mardell describes as being “obsessed” with the notion of American decline. The US is actually – laudably, to hear the BBC tell it – taking a back seat. Or, as Mardell would have it, “leading from behind”. This is obviously a definition of “leading” of which I wasn’t previously aware. So, if the hated Fox News is clearly reporting from a pro-US, right-wing bias, a news organization which reports from the exact opposite perspective – not just different, but opposite, mind – must by definition be Left wing. I’m not talking about which report one agrees with: I’m talking about the angles and perspectives involved. All of the BBC’s reporting from now on for this war for oil….no, sorry, UN-backed war for human rights, is slanted toward this angle. Just remember the Narrative that the US taking a back seat and following along is considered “leading from behind”. No problem, no bias, right, BBC? UPDATE: While the Secretary of State is in Paris leading the US operations in Libya, the President Himself is sucking up to Brazil and waving at us from afar. Leading from behind, indeed. I assume Mark Mardell approves whole-heartedly, as he says that US decline is a doddle. By David Preiser (USA) | March 18, 2011 - 4:23 pm | October 28, 2012 anti military action, BBC bias, Hillary Clinton, Mark Mardell, obama bias, pro Obama, PRO OBAMA AT ALL COSTS. Hillary Clinton told CNN the other day that she won’t be working for the President if there is a second term in 2012. Not just that she doesn’t want to be Sec. of State again, but wants no position at all in His Administration. She told Wolf Blitzer that she doesn’t want to be Sec. of State again because she has the best job in the world right now. Because I have the best job I could ever have. This is a moment in history where it is almost hard to catch your breath. There are both the tragedies and disasters that we have seen from Haiti to Japan and there are the extraordinary opportunities and challenges that we see right here in Egypt and in the rest of the region. So I want to be part of helping to represent the United States at this critical moment in time, to do everything I can in support of the president and our government and the people of our country to stand for our values and our ideals, to stand up for our security, which has to remain first and foremost in my mind and to advance America’s interests. And there isn’t anything that I can imagine doing after this that would be as demanding, as challenging or rewarding. Hang on, Mark Mardell has been telling us that The Obamessiah has been thoughtfully “deliberating”. So will he now claim that Hillary Clinton is wrong to think He’s been dithering because she’s “unfamiliar” with the concept? Or does she know better than the BBC North America editor because she’s, you know, on the inside actually dealing with reality and not making uninformed judgments from on high with a perfumed handkerchief held to the nose? Will Mardell now dismiss the former two-term Democrat President of the United States and the current Democrat Secretary of State as people who are “obsessed with the notion of American decline” or gung-ho cowboys who want an “unapologetically aggressive America storming ahead”? Clinton’s announcement was not only on CNN but also mentioned on the HuffingtonPost, so we know the Beeboids are aware of it, and can’t pretend it’s not an important enough story for them to mention. So far, though, they’ve censored this news. In sum, Hillary Clinton just proved that the BBC North America editor’s interpretation of US news has been completely wrong. Why trust him ever again? UPDATE: Mardell is at it again! This time he’s giving us the spin on the President’s speech about Libya. See the comments thread for more. By David Preiser (USA) | March 17, 2011 - 1:41 pm | October 28, 2012 anti military action, BBC bias, Libya, Mark Mardell, obama bias, pro Obama, PRO OBAMA AT ALL COSTS. No sooner had I posted my complaints about Mark Mardell’s continued, slavish defense of the President and use of the BBC website to set forth his own personal opinions on foreign policy, the BBC’s North America editor put up another post on the matter. Actually he’s done two posts, but I’ll get to the second one in a minute. As if in rebuttal to my post, Mardell tells us that the President is, in fact, telling a couple Mohammedan leaders to get with the program and back the use of military force against Ghaddafi. Why we never heard about this before is unknown. Not only that, but apparently the reason the US hasn’t been leading the call for a no-fly zone in the first place is not because the President can’t make a decision or simply doesn’t want to do it, but because the US military and Sec. of Defense are against the whole idea. It’s still not His fault. Now, it’s not exactly a shock that the top brass really don’t want to get involved in this, for a variety of valid reasons which we need not get into here. But Mardell’s whole defense here is based on the idea that the only way a no-fly zone could possibly happen is if the US sends in massive amounts of military force, distracting from Iraq and Afghanistan, that we’ll get bogged down in a country which is not a major priority, and that nobody wants this to look like yet more Western imperialism. Firstly, while it may be the conventional wisdom that only the US has the military might to do anything worthwhile, who says that’s how it has to be? If The Obamessiah is, as Mardell constantly reminds us, against the childish concept of military invention, why isn’t He doing something else to put pressure on Ghaddafi? Where is His speech to the UN about sanctions? Where is His diplomatic pressure on China and Russia to help out? Oh, that’s right, both countries had their way with Him last time He tried to negotiate anything with them (There you go again, still obsessed with the notion of America’s decline – ed.). Surely a great humanitarian who, as Mardell told us, feels an emotional attachment with the Libyans’ quest for freedom, and was dead set against using military force, would be working night and day on alternative solutions. Yet we see….what? Scowling? Thoughtfulness? I mean, I’m not even one of those demanding an “unapologetically aggressive America storming ahead”. I’m just asking for the President to do what Mardell said He wanted to do: be on the right side of history. I could care less about military intervention per se. If there are other alternatives, it’s fine by me, and would, I suspect, be fine with most of my fellow United Statesians who are looking for our President to act like a world leader when called upon. And that’s the key element missing in all of Mardell’s blogposts and reporting about the President and this situation: the people of Libya are asking for help. Unless we’re getting yet another vox pops from Benghazi or something like that, the BBC’s reporting makes it seem as if the only people calling for intervention are ill-advised or foolish warmongers. As Ghaddafi gets closer and closer to shutting down the rebellion and continues to slaughter his own people, it’s looking less and less moral to sit back and watch it happen. What’s really wrong with the perspective from which Mardell and the BBC report is the Narrative that the President has sat on His hands because He doesn’t want it to seem like US imperialism, forcing dumb ol’ democracy on people who are culturally opposed to who don’t necessarily want it right now. What about all those Libyans we keep hearing asking for help? How would we be imposing a nasty foreign idea on people who are telling everyone who will listen that this is what they want? If that’s what the President and His Administration think, then I say they’re pretty misguided and missing the point. Mardell seems uninterested in considering this either way, as he’s stuck in ideologue mode. Bahrain may be more strategically important in one sense, but Libya is the poster child everyone’s looking at right now, including the Bahrain leaders. Ghaddafi chose not to follow Mubarak’s laudable example, and should face the consequences, and the leaders of Bahrain would get a clear choice of options if he does. It’s not a difficult concept. But none of this is seriously addressed by the BBC. Most of the talking heads they have on have been advocating against a no-fly zone. Sure, they’re full of admonitions about the practicality of it, and sounding very sober, yet the discussion has been mostly one-sided. And I don’t even mean we need to hear more from people calling for the bombs to start falling. Where is the discussion of alternatives to a US/UK bombing run? If there isn’t one, do we ever get to blame the world leader who was supposed to be The One to make the US a world leader of morality? Now for the second post. Now the US Ambassador to the UN, Susan Rice, has said that the resolution which is being discussed may need to go beyond this proposal, adding that no-fly zones have “inherent limitations” in protecting citizens at immediate risk. She said the UN Security Council is focused on swift and meaningful action to halt the killing on the ground. We’re told that is diplomatic speak for airstrikes and bombardment from the sea. Sending in troops has been ruled out. She has a point. Most in the US top brass are scornful about the idea of a no-fly zone. The US flew more than 30 sorties a day over Iraq and it didn’t bring down Saddam Hussein. Except the no-fly zone wasn’t meant to oust him. It was meant to stop him from slaughtering the Kurds, the Marsh Arabs, and loads of other people he didn’t like, and invading other countries again. And it worked. I can sense reality quietly slipping away here. No-fly zones would have been no good against the awful massacres of Rwanda and Srebrenica. What does this have to do with anything? Nobody was calling for a no-fly zone then. Different deal entirely, required troops on the ground, and nobody wanted to do anything because it was an “African problem”, to be solved only by Africans. Same with Zimbabwe, in case Mardell is thinking of bringing that up next time he’s advocating against military action. Or Darfur, for that matter. And Srebrenica? Is he joking? What does he think stopped the massacres in the Balkans of getting even worse? A BBC charity telethon? Even Matt Frei understands what happened there, and how it relates to Libya. There’s been serious debate inside President Obama’s administration about the wisdom of using military force at all. There’s an aversion to getting involved in another war with another Muslim country, or giving the impression that democracy is a Western plot. Libya is seen as a distraction, not a core US interest. Again we get the blame spread around, and again Mardell puts forth the lie that this is going to look like US imperialism. Again we’re asked to pretend that George Bush was wrong and nobody in the Arab and/or Muslim world really wants democracy. Again we’re asked to sweep all those cries for help under the rug. Again we’re supposed to pretend that Britain and France and a few other countries couldn’t do a nicely symbolic move with only auxiliary support from the US. All to maintain ideological purity. Also, I love how it’s acceptable again for the US to let dictators slaughter their own people where it’s not a core US interest. It’s not selfish or parochial at all now that Bush isn’t in charge. What happened to the criticisms of US hypocrisy because we invaded Iraq and Afghanistan but won’t do it in other cases? Sometimes leadership doesn’t look pretty, or look like a choreographed TV speech. Sometimes it requires compromise and cooperation. Sometimes leadership requires actually leading. But it never looks like taking a back seat and hoping somebody else steps up, no matter how Mardell wants to spin it. There is still no discussion from Mardell or anyone from the BBC about why, if the President doesn’t want the US military to go in there, He hasn’t been working night and day to get every other Muslim country to put real pressure on Ghaddafi. If the US has no useful influence in the region now, what was the point of all that bowing and scraping when the President was doing His first meet-and-greet sessions? What happened to the world leader whom the BBC told us was going to redeem the US in the eyes of the world? This is His chance to make the US look good, but since He’s ideologically opposed to it, it’s making Him – and the country – look not so good. Again, I’m not talking exclusively about a bombing run. There are many other options which would put pressure on Ghaddafi and be just as positively symbolic. A naval blockade, neighboring countries other than Egypt putting serious troops on the borders, shutting down his bank accounts, just to name a few. There are many ways the President can lead and make the US look good without blowing anything up. But that’s not happening. Not because the President is so deliberate or thoughtful, not because His Administration wants to “base decisions on facts” (a sly dig at Bush there), and not for any other reason Mardell wants to push on you. It’s because of poor leadership, and an ideological opposition to having the US take a strong position on the world stage. We knew that during the election in 2008, and we’re seeing the fruits of it now. The BBC continues to dismiss that notion, and spin the story every other way possible. By David Preiser (USA) | March 16, 2011 - 5:54 pm | October 28, 2012 BBC bias, Libya, Mark Mardell, obama bias, pro Obama, PRO OBAMA AT ALL COSTS. Mark Mardell is still desperately supporting the US President about His behavior regarding Libya. The President still hasn’t made a decision, is in fact hoping the problem is solved for Him, and Mardell is faithfully defending Him. Translation: I’m not gonna try it – you try it. Oh, and He’s not George Bush. “Grown up” is an editorial appraisal of policy. Of course, by making it epistemic, he probably gets through a loophole in the BBC style guide. But this is so obviously where he stands, especially framed in the context of his other blog posts and reports on the subject in which he comes from the same perspective. Mardell also spells out the correct interpretation for you: it’s “deliberation”, and anyone who thinks otherwise just doesn’t get it. Why isn’t Mardell asking whether or not the Administration is pressing the Arab League to get off their asses? If, as is alleged here, He would “dearly love” for them to lead the attack on Ghaddafi, surely we’d hear about how much He’s working towards that goal? And wouldn’t Mardell be reminding us of that here, just to support his case that his beloved Obamessiah is actually showing leadership and the fools just don’t see it? If not, one would be forgiven for suspecting that maybe He doesn’t want it to happen at all, or simply has no opinion, and is just waiting for others to do it for Him. Mardell seems uninterested in addressing this obvious point. In a country where some are obsessed with the notion of America’s decline, it will confirm some people’s worst fears. “Obsessed” is an editorial choice which suggests an excessive, inappropriate, possibly unhealthy attitude. A more accurate and less biased term would be “concerned”. I’d even accept modifying it with “very” or “seriously”, or possibly “overly”, if I’m feeling really generous. Furthermore, this ignores the argument about the President actually not wanting the US to have such a strong position in the world. In fact, Mardell has been spinning this whole thing away from the idea that it’s, you know, normal for people to want their country to be in the best possible position for economic and security issues. Who wants their country diminished? Why is that considered “grown up”? How maintaining this strong position is achieved (or how one even defines it, I suppose) is of course a topic for another discussion entirely. Here I’m concerned with the idea that people naturally want their country to have the best position possible, and that it’s not right to define this as a being somehow unnatural or incorrect behavior. The main idea of my last post was that there is a valid reason to be concerned about the President actively wishing to reduce the US’s standing on the world stage. It may be out of a far-Left desire to stop being individuals and let the committee decide what to do, or it might simply be out of a lack of interest and deep understanding of world affairs, and just how much foreign policy can sometimes affect the domestic scene. Either way, it’s a legitimate debate to be had, especially the way He spoke during the election and just how much the BBC and Leftoid media kept telling us that this was pretty much what He was going to do if elected. Mardell lets the White House get in the last word again, even making sure to tell us that criticism is so bad and unfair that the White House has had to “push back”. In all, it’s another White House propaganda piece, with personal opinion thrown in, from the BBC’s North America editor. The context for this was the President’s unhappiness with how tough being President of the US is these days, with everyone looking to Him for leadership on what to do about Libya, Bahrain, and all the other Mohammedan countries where the citizenry is protesting against their autocratic rulers. Not to mention (and the Times doesn’t, because they are trying to protect Him just as much as the BBC does) the difficulties He’s facing at home right now regarding the economy, Wisconsin and the unions, the Tea Party movement, etc. Now, imagine for a moment if George W. Bush had said something about wishing he was an autocratic ruler who had the power to control the media and have opponents arrested and disappeared on a whim. The BBC would be all over it, and their North America editor would be writing scornful blogpost after scornful blogpost, to go with a couple of segments for Today. The fact that they haven’t done this means that the Beeboids simply don’t see this as remarkable at all. Not only do they sympathize with Him, but Matt Frei actually once openly wished for Him to be an autocratic ruler as well. As DB said at the time, Matt Frei was heady with enthusiasm over the limitless possibilities for Change�™ at the dawn of The Obamessianic Age. The Beeboids certainly weren’t so enthusiastic for autocratic rule in the US back when Bush was elected. Have a look at their First 100 Days recap from 2001. It’s relentlessly negative. After reading that, get out the sick bag and remind yourselves of what the BBC put together for their beloved Obamessiah. Celebration after celebration. Actually, I see something far worse in that quote. It reveals something about Him I was talking about here recently (pg. 8 on the Open Thread): He just isn’t interested in the US having a real leadership position in the world. Right now, what many see as a lack of leadership and will over Libya is defended by Mark Mardell as pragmatism and a sign of His method of creating a better relationship between the US and the rest of the world. If we end up doing nothing and Ghaddafi kills more of his own people and ends up staying in power, Mardell accepts it willingly, because it would be His will. The Obama administration is using the crisis as a test case. The key is whether the Arab world, the Muslim world will “cowboy up” and back some action. Although Mr Obama and Mrs Clinton have been crystal clear that UN backing is need, an invitation from the Arab League, or a coalition of Arab nations, to take action might tip the balance, as would an attention-grabbing massacre on the ground: at the UN there talk is of a “Guernica moment”. If neither happens, Mr Obama may simply accept that an autocrat he has called on to go, is going nowhere. In other words, sitting back and waiting for someone else to lead the way is not a sign of weakness or inability or – my personal opinion – lack of caring. Ironically, Mardell makes sure to tell everyone – again reading the President’s heart and mind for us – that He feels some sort of emotional connection with the protesters getting killed. Not sure how he squares that one when looking at himself in the mirror every morning. Just the day before, Mardell was talking to Sen. John Kerry, who was the only high-profile Democrat really calling for the US to go in and do something (as opposed to Government officials talking about considering options or whatever). Even then Mardell was trying to shift blame away from Him. Other countries aren’t going to do anything, so why should He? Even as he acknowledges in the later post the irony of so many people who used to be hyper-critical of US intervention are now crying for us to do something, Mardell doesn’t see anything worth remarking about the President’s handling of the situation. Everything is either someone else’s fault, or something where He gets it right no matter what. The thing is, what just might be the most damning part about that quote is the fact that the reason that we really do have what so many people either feared or celebrated: the first Post-American President. The Beeboids can work to defend Him all they want, but what we’re seeing here is someone whose personal agenda has very little to do with having a success foreign policy which will strengthen the US. The reason He notes that nobody in Tahrir Square (or Tobruk, for that matter) cares about what Hu Jintao says is because He knows that China isn’t where the world looks for leadership in times of crisis. Whether the BBC likes it or not, the US has that position. And He’s squandering it, while they defend Him. When Bush was in charge, we heard all the time about how he had weakened the US’s stature, and then we heard about how The Obamessiah would restore us to our rightful place. Now that He’s not actually doing it, the BBC is shifting blame and pretending it’s not happening. Today is being called the second anniversary of the Tea Party movement in the US. The genesis of the movement actually began with a small taxpayer protest against the Democrat’s massive “Stimulus Bill” spending plan in Seattle, WA, on Feb. 16, 2009. They called it the “Porkulus Protest”. As it happens, conservative blogger Michelle Malkin actually referred to the Boston Tea Party when she posted about it on the day, although the name didn’t stick at the time. This was quickly followed by protests in Denver, Kansas, and a couple other cities, including New York. It was on Feb. 19th, when Rick Santelli of CNBC made his on-air rant about how the country needed a new version of the Boston Tea Party that the name came to life. The impetus was already there nationwide, and word about the other protests had already spread like wildfire on the internet. And so a movement was born. Hundreds of protests large and small popped up individually all across the country. The BBC refused to mention any of it until reality forced them to acknowledge hundreds of thousands of people protesting on April 15. In case anyone has forgotten, or isn’t aware of how the BBC treated the movement and its participants, here’s a reminder. It’s no exaggeration to say that the movement was directly responsible for the Republican victories in November, and the current state of play in Congress. With this background in mind, let’s look at the latest BBC article about the fiscal policy scene in the US. US President Barack Obama has urged Congress to find “common ground” over the budget to prevent a government shutdown. Although Mr Obama is empowered to propose a budget, it is up to the US Congress to pass it into law and then to distribute the funds. Whew, that was close! A reader nearly thought He was weakened for a moment. Thank goodness it turns out that the office of the President never had the power to force things on Congress in the first place. “Next week, Congress will focus on a short-term budget. For the sake of our people and our economy, we cannot allow gridlock to prevail,” Mr Obama said in his weekly radio address. Naturally the BBC then has to spin the laughing-stock of a budget He actually proposed. Notice how they use His talking points again. The president unveiled his proposed budget earlier this month and described the proposal as a “down payment” on future cuts to the US budget deficit. He said the US had to live within its means and called for some reductions, but said “we can’t sacrifice our future” with drastic cuts. No mention at all that it was a completely irresponsible budget proposal, and a deliberate defiance of the voters in November. Here’s a more honest point of view the BBC won’t let you hear. Sounds a lot like Labour-speak, no? No wonder the BBC supports Him to the bitter end. In fact, His budget adds more than $7 trillion to the deficit over the next decade. This is not fiscal responsibility by any stretch of the imagination. If He hadn’t given the finger to the voters like that, we wouldn’t be facing gridlock right now, and He wouldn’t have to call for togetherness like this. This situation is His own fault, but the BBC won’t tell you that. Instead, they’ve decided that – surprise! – blame lies elsewhere. But Republicans, who control the House of Representatives, do not think the cuts go far enough in tackling the deficit. Republicans put together an interim proposal to cut $4bn (£2.5bn) in federal spending on Friday as part of legislation to keep the government operating for two weeks past the deadline. House Democrats have reportedly responded positively to the plan, according to CNN. Neither party wants to be blamed for a government shutdown, but the Republicans say any plan will have to include cuts. “Our goal as Republicans is to make sensible reductions in this spending and create a better environment for job growth, not to shut down the government,” Senator Rob Portman said in his party’s weekly address. You’re meant to take away from this the idea that, no matter what happens, it’s going to be the Republicans’ fault, and that the President tried to stop them. The BBC won’t spend a moment acknowledging the Tea Party movement’s anniversary, or what it has accomplished in spite of the vicious attacks from the media (including the BBC) and the Leftosphere. There’s much more to do, of course, and 2012 is still a long ways away. But whatever happens in future, don’t trust the BBC to inform you. On Thursday, when the new Congress is seated and begins work, there will be an historic moment, something that hasn’t happened since the founding of United States: the US Constitution will be read out in the House of Representatives. It’s a statement by the newly-elected and Tea Party-influenced Republican majority that they heard the voters and they’re realigning their priorities. Naturally, the Left is shocked and outraged. Ezra Klein, founder of the notorious but thankfully defunct JournoList (source of the majority of viewpoints on US issues the BBC fed you for the better part of two years), has gone so far as to say that we shouldn’t pay so much attention to the Constitution as it was written over 100 years ago and thus is too “confusing” and so nobody can understand or relate to it anymore. The BBC correspondents assigned to the US will be aware of this, and some of them at least will be aware of its significance. Yet, they haven’t reported it so far. Possibly, they’re waiting until it happens so they can report on the reaction and portray the Republicans as hyper-partisans intent on forcing their ideology on Congress. I think we can guess the angle from which the BBC is going to approach this, no? Excuse me? All of a sudden we’re going to have party-political acrimony now that Republicans want to do something? What do you call what’s been going on for the last two years? This is written from the Democrats’ point of view. Naturally. Just like I’ve been saying for some time now, the BBC wants you to think that bi-partisanship is good: when it involves advancing The Obamessiah’s agenda. When it’s something someone else wants, suddenly the Beeboids hold their noses and cast aspersions. And what do you know, the President Himself wants us all to work together. On Tuesday Mr Obama appealed to Republican congressional leaders on to put partisan politics aside to rebuild the US economy. You see, He wants to fix the economy, while the nasty Republicans are willing to destroy it for ideological purposes. Funny how so many in the business world think He’s the one destroying the economy due to ideology. Not that you’d ever hear that viewpoint allowed through over the BBC airwaves or online. I feel a statement from the White House coming on…. Speaking on board Air Force One as he travelled back to Washington from a holiday in Hawaii, Mr Obama said: “You know, I think that there’s going to be politics. That’s what happens in Washington – that they [Republicans] are going to play to their base for a certain period of time. But the BBC doesn’t want you to know that. They’re intent on maintaining this phony impression in your minds that one side has bad intentions while the President is a force for good. Any evidence of actual reasons the Republicans have given for wanting to repeal ObamaCare? No, all we get is the equivalent of “critics are critical”. All you need to know is that whoever objects is simply on the other side, and of course it’s only natural that they’d object. It’s a slick way of dismissing the opposing viewpoint altogether. You know, it’s funny, but I remember when the BBC was trying to create the impression that ObamaCare was going to provide health care for all those millions of uninsured for whom we were supposed to have sympathy, and not that it was merely a law to make it compulsory to buy it. But anytime the government tries to make any behavior compulsory, people are going to be understandably concerned (What, you mean it was actually about a policy and not just racism? -ed.). The BBC did quietly report about one challenge from the State of Virginia. Which brings me to the point of this post. The United States is a Republic made of individual States. When the Founding Fathers created this country and wrote the Constitution, each of them viewed their State as their country. There’s an inherent idea of autonomy, and the rights of States and limits of the Federal Government are entrenched in the Constitution. ObamaCare and other Obamessiah and Pelosi/Reid/far-Left policies (such as allowing the EPA to cross over into another branch of government and control things normally left to the Legislative branch) can be considered un-Constitutional. For quite some time there has been a growing argument about whether or not the Constitution is a “living document”, to be watered down or ignored on a whim whenever the wind of modern culture changes. Of course, those who advocate such a position suddenly get all protective when it’s nasty Republicans wanting to add an Amendment. In fact, that’s exactly what’s happening over the growing noise about a proposed “Federalist” Amendment to give States the power to declare a Federal law un-Constitutional by each of their legislatures voting on it. Giving power back to the States (or, more accurately, allowing the States to exercise the power they had from Day One but which has been leeched away) is a challenge to the supreme executive power, a challenge to the strong man leader so many on the Left wish we had. Perhaps if this comes to pass Matt Frei will once again pine for a bit of Chinese-style autocracy, and folks like Woody Allen will wish the President could be a supreme dictator, if only for a few years. This is why the Republicans want to have the Constitution read out to start the new session of Congress. It’s much more than a challenge to ObamaCare. It’s a statement of priorities, of respect for the rule of law, and a stand against the Democrats (and a few old-guard Republican leadership) and their attempts to force their most extreme desires on the country against the wishes of the public. In other words, it’s a statement about what they think the Unites States is all about. I await the BBC’s reporting on the matter, fully aware that this doesn’t help that particular rapport with the US they want to create for you. Mark Mardell is basking in The President’s glory in his latest blog post, and getting things completely wrong, as usual. Although Mardell is aware that He isn’t really as magical and all-powerful as He once was, he still wants his audience to know just how incredible His Rule has been for us all. A Golden Age in the White House come to an end? The only chink in His armor, to hear Mardell tell it, is the “horse trading” deal with the Republicans on extending the Bush tax cuts. That was the one where the President had to call in Bill Clinton to convince enough Dems to vote for it and not screw everyone over for purely ideological purposes. But what Mardell doesn’t want you to know is that this was such a problem for Him that He has now banned the use of of the word “triangulating” by His staff. How pathetic is that? What’s really ridiculous here is that, while Mardell is preaching so enthusiastically about His accomplishments, it was only a week ago that he was clucking his tongue at how these same accomplishments he’s praising now were rammed through during the lame-duck session of Congress in a way that looked “unseemly” to outsiders like him. But that’s all forgotten now, I suppose, while we bask in His glory. This has been a magical year for the US, one in which He brought us one step further out of the darkness. Will you remember the 111th Congress as a Golden Age? I suspect Mr Obama wants the American people to learn to feel nostalgia for the past two years. So do you, Mark, which is why you and your colleagues always promote the White House talking points. Of course, Republicans regard it as a period of unmitigated disaster. Only Republicans? Once again Mardell displays either his ignorance or his deliberate dishonesty. What about all those independents who regretted voting for Him the first time and went Republican in November? What about all those Democrat candidates who ran against ObamaCare and higher taxes? The Tea Party movement wasn’t an exclusively far-right Republican club the BBC kept trying to tell you it was. Yet Mardell is still stuck in hyper-partisan mode. Many Americans will regard it as a period of much muddle and unnecessary politicking. No, that’s only those on the far Left who supported even the most extreme parts of the President’s and Democrat leadership’s agenda. Much of the rest of the country hit the streets to protest it, and/or voted in November to kick many of them out. Only far-Left ideologues like Mark Mardell think that the Tea Party movement and politicians starting to listen to the people was “unnecessary”. As usual, the mindset is “Let’s all work together: when it’s my idea. When you want your way, that’s nasty politicking and bad for the country.” Mardell is speaking from one side of the argument. Even die-hard Democrats don’t feel a huge amount of pride in its achievements. Ah, so Mardell does remember his blog post from last week. But why wouldn’t they feel much pride? Because so much of it was ultimately bad for the country? Is it because the really far-Left voices are angry that the President hasn’t done enough to move the country further to the Left? Mardell isn’t going to tell you. He’s only projecting his own disappointment that it wasn’t all glorious and everyone is ecstatic about His Administration. Why isn’t Mardell asking if the President and Pelosi and Reid maybe went too far to the Left for the nation’s comfort? It’s because he agrees with the ideology behind all of it, and thinks that anyone against it is a Republican stooge. Yet Mr Obama said that it was “the most productive two years that we’ve had in generations”. He wants the day to be remembered as a time when things got done, when people could agree, when progress could be made. It is going to be an interesting new year. See? “When people could agree”. It was a Democrat-controlled Congress. They got their way a lot. Nobody in the country thinks the last two years were about bi-partisan loveliness. That’s an absolute joke. The President and His staff know perfectly well that they had to force everything through, and that they won’t be able to do it in a real bi-partisan atmosphere. It’s moronic to suggest otherwise. The President spent two years denigrating His “enemies”. And Mardell believes He wants everyone to think it was all friendly reaching across the aisle? The President wants everyone to realize how great He is, not how bi-partisan Washington has become. Mardell’s rewriting history at an alarming rate. Even in the lame-duck session, the only thing besides the tax bill which was bi-partisan was the repeal of Don’t Ask, Don’t Tell, and enough Republicans were happy to do it that He didn’t have to actually do anything. He passed the buck to Congress on this one, and they did it themselves. Yet we’re all supposed to think it’s one of His triumphs. He had very little to do with this, but don’t expect Mardell to tell you the truth. No mention, of course, of the failed gargantuan spending bill, or the DREAM Act, which died because the Tea Party movement put Republicans and a few Dems on notice. No, we only hear about His successes. No mention of the defeat in November because that’s all been wiped away by the passage of Don’t Ask, Don’t Tell, right? Take that, hecklers! If the country voted overwhelmingly against so much of what the President and the Congress achieved these past two years, why would they remember it as a Golden Age? It’s silly to even think such a thing, unless one is a Democrat ideologue. It’s echoes of St. Jon Stewart’s “Rally to Restore Smugness”: Let’s all work together – for the Democrat agenda. Working together is good – for the Democrat agenda. Mardell whines about it when he’s worried it doesn’t make his beloved Obamessiah look good, but then leaps at the chance to celebrate it when it suits his message. It’s that time of year when Handel’s Messiah is performed all over the place, so I thought it would be an appropriate time to look at how the BBC has been reporting on their beloved Obamessiah. After the kicking He and the Democrats got in the mid-term election, there was much worrying in certain quarters about whether or not He would be able to rise again after the stinging defeat of the Democrats in the recent mid-term election. Matt Frei was concerned about whether He would be able to rekindle the connection with the masses, and continue to promote His agenda against a Republican-led House of Representatives and a tiny Democrat majority in the Senate. There’s been quite a bit of activity in Congress during this lame-duck session, so naturally the British Public must be informed of every detail of the domestic agenda of a foreign country. So, how is He doing? Unhappy about extending Bush’s tax cuts for the evil rich? Not to worry, this is His Plan For Us now. The President worked out a compromise with the Republican leadership and extended the tax cuts, as well as giving businesses a break in payroll taxes, while getting in return some extension of unemployment benefits and more subsidies of green energy boondoggles. Most people view this as an overall victory for the voters who let their elected representatives know that they needed to drop the ideology and get fiscally responsible. Even departing Treasury guru (and Keynesian former boss of BBC economics editor, Stephanie Flanders) Larry Summers told the President this needed to happen. The President who spent months attacking the evil rich and declaring how He would never accept what He called tax cuts for “millionaires and billionaires” caved, yet somehow the BBC sees this as a triumph for Him. The report is full of the Democrat talking points, but nothing from a voice discussing how this would actually help the economy recover. In fact, the one time the BBC does mention that businesses think this will help, it comes from a Democrat who shrugs his shoulders and acts as if this is a gamble. According to the BBC, it’s all about tax cuts for the wealthiest. Class warfare is the Narrative, as usual. At no time in their coverage of this issue has the BBC given time to the point of view that the Democrats wanted to hold the middle classes and small businesses hostage over the ideological point of attacking the wealthy. If the Dems had gotten their way, taxes would have gone up for everybody, not only the evil rich, simply to score an ideological point which has nothing to do with economic necessity – unless one is a pure tax-and-spend ideologue. Which is the viewpoint through which BBC reporting on this issue is filtered. True, Obama has greatly angered the left of his own party. In the House, 112 Democrats voted against the package. Some say he’s a bad negotiator and has betrayed his principles. Well, annoying the left may be a cheap trick for leaders of left-of-centre parties (cf Tony Blair) but it often goes down well with voters in the middle ground. Or even on the right. Time and time again, even at Tea Party meetings, I’ve heard that President Obama has not governed as he was elected, that he’s been captured by the “Pelosi-Reid agenda”. This is his answer. According to Mardell, it’s not the Tea Party movement successfully influencing the President: He’s making a shrewd move to fool them for a little while. Seriously, how can anyone think that the candidate who notoriously told Joe the Plumber that “when you spread the wealth around, it’s good for everybody “ is a centrist who was “captured” by the far-Left Democrat leadership? 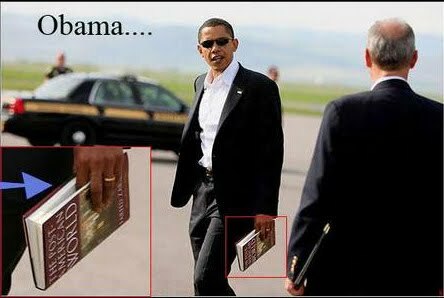 You know he’s not really saying that The Obamessiah is a shyster like Blair. No, Mardell sees this as a shrewd political move so He can attack tax cuts for the wealthy in 2012. Which will be difficult seeing as He’ll just come across as a weak leader who was forced to make a bad deal. I suppose the fact that He had to bring in Bill Clinton to convince enough Dems to vote for it is also a display of His ability to lead? But Mardell sees only strength and cleverness. So does Paul Adams, in the inset “Analysis” of the report I’ve linked to above. But the fact remains that six weeks after disastrous mid-term elections, Barack Obama seems to be reasserting his authority. Reasserting Clinton’s authority, maybe. Oh, that’s right the BBC censored the part where the President took a powder during that press conference and let Clinton take over, so maybe Adams – the BBC’s man in the White House press corps – has wiped that from his own memory as well. His real triumph, though is something Congress did, not Him: repealing Bill Clinton’s “Don’t Ask, Don’t Tell” law. The President, who campaigned against this in 2008, could have used an executive order to get rid of this any time He wanted. But He passed the buck to Congress on this one, and they used the giddiness of the lame-duck session to take care of it. To hear it from a certain Beeboid in the US, though, it’s still His achievement. The BBC’s Iain Mackenzie in Washington says the vote is a major victory for Mr Obama, who had made overturning “don’t ask, don’t tell” a key policy objective. There’s one other big issue which came up for a vote: the DREAM Act, which is about creating a path to citizenship for the children of illegal aliens. This is seen by some as a first step towards amnesty for all illegals, as this would inevitably be used to permit illegals to remain in the country if they have what naughty people refer to as “anchor babies”. Does this sound familiar? It’s a very relevant issue to what’s going on in Britain right now. Yet the BBC has censored news of this. Why? Because it was defeated. I’ll refrain from making a sarcastic retort about how I guess now we should be releasing all criminals from prison if they have kids, as imprisonment of these criminals is clearly also punishing innocent kids. Other people on the Left are angry as well. Worse, the President apparently lobbied pretty strongly for this, yet it still failed. Where’s that authority and leadership now, BBC? Why so shy about reporting this? The BBC spent a huge amount of effort bashing Arizona over its immigration law, and told you that opposing illegal immigration is tantamount to racism. Just like they do about the problem in Britain, they used the smokescreen tactic of saying “immigration is good, it’s silly to be against immigration”, always leaving out the “illegal” part and misrepresenting the opposing viewpoint. In the US, they hired a German immigrant, Franz Strasser, to travel around the country making a dishonest series of reports about immigrants in the US. I complained about it here at the time (actually several times). Strasser also censored the word “illegal” from his series of reports. His trip even took him to two Sanctuary Cities, which had official policies of deliberately flouting immigration laws, yet he refused to mention the fact that they were designated as such. The whole series was a smokescreen. So now the DREAM Act failed, and the BBC is silent. The Democrats’ massive, pork-laden spending bill also failed. As I said on Thursday’s Open Thread, the BBC reported it from the Democrats’ point of view, that it was a vital spending plan needed to keep the country running. They did not allow through a viewpoint that possibly the Tea Party movement had any influence on politicians’ behavior. In fact, pretty much every BBC report about what’s going on in Congress right now is free of any mention of the movement. They did, though, worry about how “time was running out”, but from the Democrat perspective, as if it was the only one. Come see the bias inherent in the system. The BBC spins the news to promote the accomplishments of a leader of a foreign country, and censors news which detracts from that Narrative. PS: All Biblical quotes appear in the Messiah. Post written while listening to the recording by the late, great Richard Hickox, featuring Joan Rodgers, Philip Langridge, Bryn Terfel, and others.